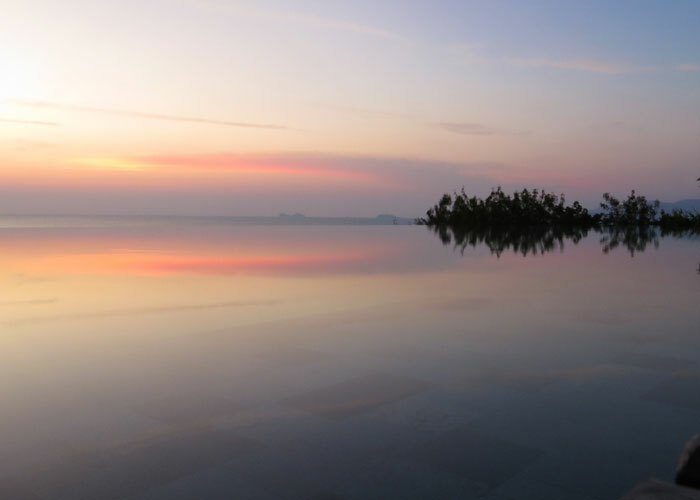 Looking out to the sea and horizon beyond, regular dips in Six Senses Samui’s serene infinity pool were a necessary compromise when temperatures hit 35 degrees and above. Tough going, I know! An average swimmer at best (one of the only barriers delaying me from entering my first traditional triathlon – although I think it’s time for that to change), I was thrilled when I managed 25 50m lengths in a half hour. Including a few stops to admire the view, naturally. I started with 15 and added a length or two daily. I’m all for sunbathing, but pair a powerful hit of vitamin D with some post-swim endorphins and colour me ecstatic. And having realistic, incremental goals is a great way to enjoy fitness on holiday and set healthy routines for your return home. One thing I wish I discovered sooner in the holiday (though better late than never): sunsets are better enjoyed twice. Once in the sky. Once in the pool’s reflection. Come 630pm, Six Senses’ poolfront becomes the visual equivalent of surround sound immersion. Think the final ‘Om’ in yoga class. The euphoria of crossing the finish line of a race having surpassed your PB goals. The butterflies that flood your stomach when you take on a challenge that seriously scares you. These sunsets were all the best things in life rolled up into one incredible all-natural nirvana. Let the bliss continue at the hands of Koh Samui’s most skilled spa therapists. The Six Senses resort offers guests a complimentary 30min foot massage, and the management team are no fools. We were back for more. Twice. I was hitting it extra hard during gym sessions just for an excuse to book another massage in the sea view treatment villas. Muscle release, more energy-lifting lemongrass scents and the restorative gong of the ‘singing bowl’ meant every treatment transported me to a subconscious state I arose from with reluctance. In fact, I found the Thai singing bowl sound so therapeutic I’m now on the hunt for one to serve as a centrepiece in the house and become part of new yoga and bedtime unwind rituals. Know where I can get one? Please drop me a line or leave a comment below this post! I will be forever grateful! It wasn’t all pampering. I spent an hour at least every other day in the air conditioned gym, mopping up sweat with refridgerated lemongrass scented towels – the perfect motivation to squeeze in another rep or round! I posted an example of my favourite holiday workouts last year – check out my sun lounger circuit if you missed it. I typically combine HIIT wiith full-body conditioning because I don’t know when I’ll next have access to a gym while travelling, but this time we stayed in the same resort for 10 days so I went back to training splits. Legs day. Upper body and core day. Sprints and abs day. 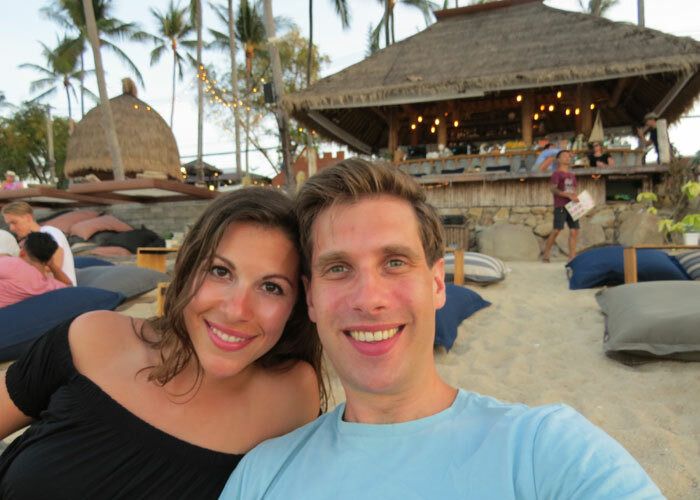 Complemented with lots of resort activities like cycling tours around the island, Muay Thai lessons, yoga classes, stand-up paddleboarding and monkeying around the outdoor gym. 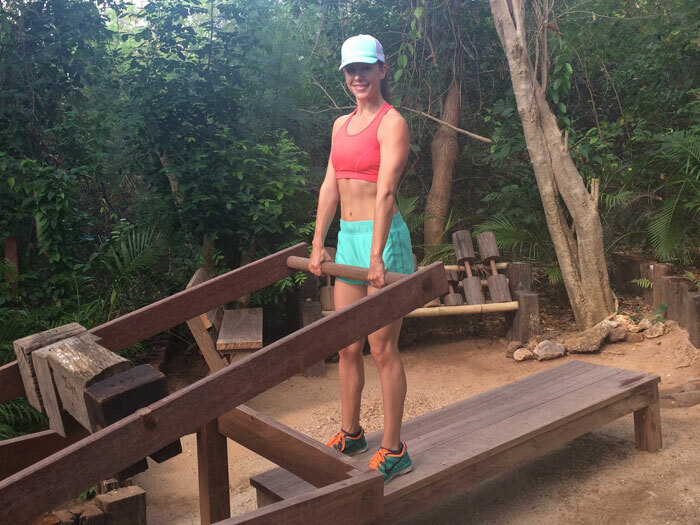 Dumbbells carved out of tree trunks? If it was 10 degrees cooler and there weren’t so many unknown insects circling, my husband wouldn’t have been able to pull me away. While I train to maintain physical fitness on holiday, I always try to increase the time I dedicate to ‘checking in’ with my state of mind. 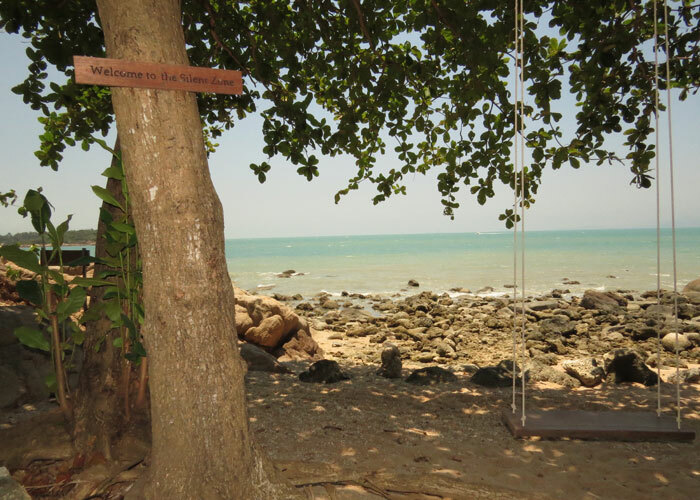 When I stumbled on this ‘Silent Zone’ – an untouched beach shaded by palm trees and furnished with hanging swings – I made a commitment to spend at least 5 minutes every day meditating on the year so far. Having made the big decision to leave a full-time career in journalism and copywriting this January, there has been a lot of change and upheaval in my life. Not to mention a pretty steady flow of nervous energy. But giving myself time to reflect on how much I’ve achieved in 4 months reminded me to trust my path and follow my heart. I won’t pretend I make time for daily meditation at home, but I do notice how making space for weekly reflection reinforces those positive thoughts and helps to hit any doubts on the head. I felt lighter every time I came away from this serene little spot and have a renewed appreciation for creating a personal ‘silent zone’. Tucking in to the local cuisine was hardly a chore. My go-to guilty pleasure at home is a Thai takeaway, and on top of eating my bodyweight in Pad Thai I couldn’t miss the opportunity to take a cooking lesson with one of the local chefs. I learned to make a spicy cabbage salad (after which I had to convince our chef that 5 chillies really is far too much for a single starter! 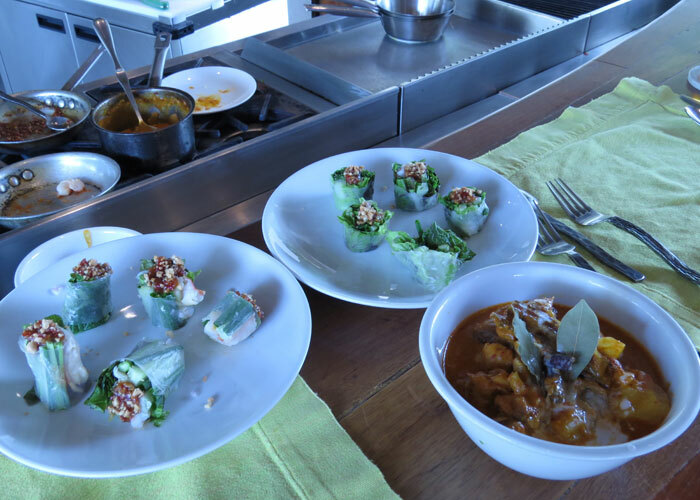 ), Massaman curry and prawn & raw veg spring rolls. I’ve already made the curry twice since returning home – it didn’t come out the same enticing creamy red but it tasted like the real deal! If you visit Koh Samui, don’t miss a trip to the Fisherman’s Village. The pedestrianised shopping, ambling and dining street gives a taste of authentic Thai culture, albeit a little diluted from the sleepless streets of Bangkok. There is one particular stop-off I can’t recommend enough. The only thing I love more than a swing on a tree is a beanbag on a beach. Add some super cool throwback tunes, the smell of shisha in the air (I don’t smoke it, but I love the fruity fumes! ), cocktails in quirky containers, surf and sand mantras and an eclectic mix of locals and tourists. 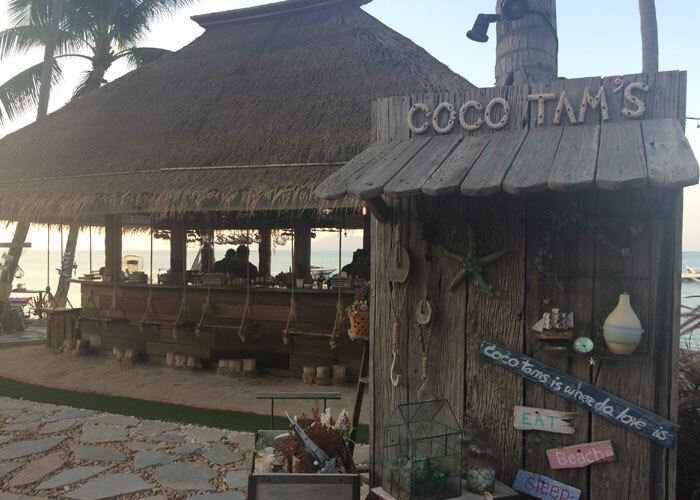 Yep, this backpacker-beloved recipe makes Coco Tams undoubtedly the coolest bar in Koh Samui. Barefoot dancing til midnight? Don’t mind if I do! 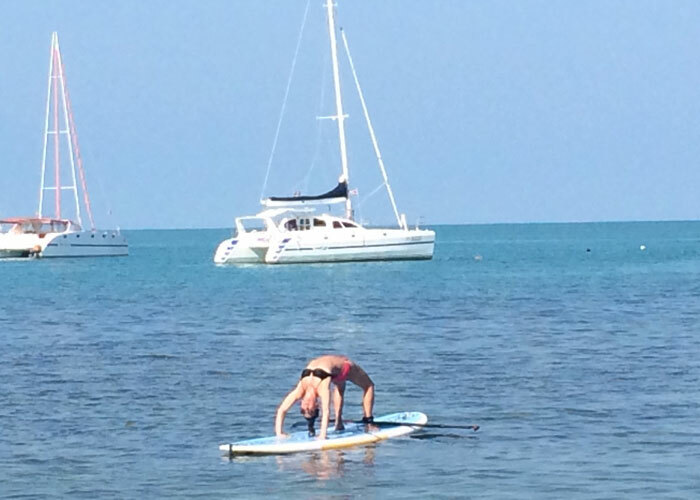 Want a do-anywhere exercise programme for healthier travelling? Taking training more seriously ahead of your summer holidays? I love helping people towards time-specific goals and breaking down the skills to make effective exercise a part of every lifestyle. Email brit@fitbritcollective.com if you’d like to train with me, or subscribe to my mailing list to receive a free 2016 rep workout programme that makes a great starting point for every fitness journey.